You can usually find Paul in the VEG warehouse on Tuesdays where he joins bits of wood together using a technique called… carpentry! 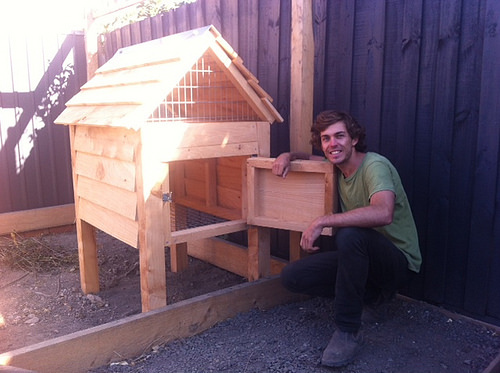 It requires handy hands to use the array of tools in the workshop to build a chookhouse or raised garden bed. He wasn’t so great with a hammer and it usually got him a blue thumb. Thankfully that hasn’t happened in a while. Touch wood! Paul completed a course in carpentry for building and construction recently and was able to study it part-time on Friday evenings and Saturdays for a year. Though it destroyed his weekend social life he recommends it as one way for permaculture people to really get practical. After Paul nicknamed Carey, Farmer Carey, then FC for short – the nickname got sent back to him as FP. This is the way it goes sometimes with nicknames. So presently all forms of communication between them – email, text, yelling in the workroom – begin or end with FP and FC. From now on in this article we refer to him as FP. 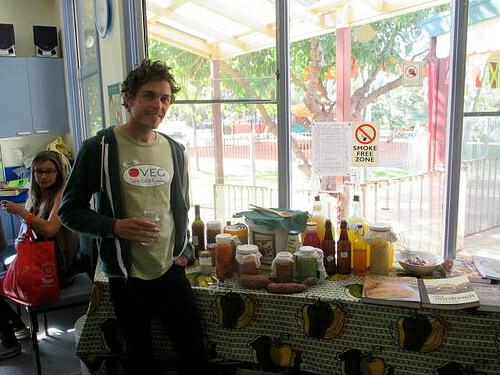 FP took time away from his stint with VEG in 2010 to work two other jobs: farmhand at Somerset Heritage Produce and manager at the South Melbourne Commons. 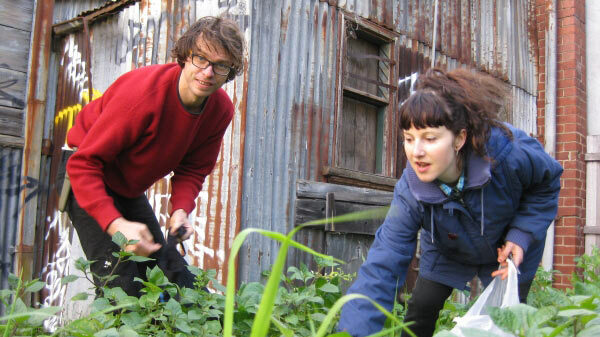 For a couple of years he maintained a balance between the city life and the fresh country air, gaining experience in social enterprise and market gardening. He likes driving the tractors. As the summer now cools to Autumn one of FP’s obsessions, or hobby, of mushrooming begins. He is captivated by them and is off to the forest whenever there’s a spare pocket of time. Luckily this hobby is largely contained by its seasonality. Here’s his mushrooming tip: use google maps’ satellite images to locate pine forests. He has done this course several times now… and recommends it to budding mushroom fanatics. On Monday mornings FP volunteers at Kinfolk cafe. Kinfolk is a social enterprise which redirects 100% of profits to four development projects in Australia and overseas. When FP is at Kinfolk he drinks many lattes and then builds things for them. During the evenings FP is plotting an return to farming – and it’s the kind of farm that will assist others who are enthusiastic farmers get onto the land. In the proposed Farmer Incubator, this farm (or network of) contributes to better social and environmental food systems through empowering novice small farmers. FP see many barriers between the next wave of farmers, the land, and their connection with the previous generation. Prospective farmers use Farmer Incubator as a stepping-stone on their way to farming independently. The people must farm again!!! 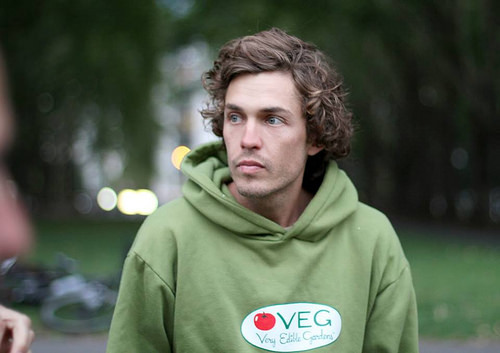 Man FP looks good in a VEG hoodie!